Wide and curvy, it lay far below the embankment where our crude jungle hut sat, surrounded by clusters of coconut trees and tangled vines. The palm fronds dripped rainwater onto the cool, moist ground. Steam rose in the humid, saturated air. I shivered. I am in the jungle. “There’s no bathroom,” Joe called from our accommodation, sparing me from having to answer. The next morning, screeches woke me. I lifted the canvas that covered the window—a square hole—and saw a baby spider monkey sitting nearby. I threw off my light cover and jumped up, grabbing some fat, ripe bananas from the table and headed outdoors. The monkey plucked a banana from my outstretched fingers, seeming to appreciate my offering. A great start to our adventure! “Oooh! Tell us more,” Marie, the Parisian, squealed. “Oh my. Magic mushrooms?” Marie giggled. “They’re not magic if they’re mushrooms. They’re hallucinogenic,” Mark corrected. Antonio sounded mysterious. “If you good person, you see good vision. If you bad person, you see bad vision. “That’s karma for ya’,” Joe said. Later that evening we calculated our weight on the metric scale so Antonio would know how much of the special brew to make for each of us. Our weight would determine the amount we drank. He shrugged with a helpless “I’m-with-her-what-can-I-do” grin on his face. “Unless you have a bad vision,” Mark taunted. I made a quick decision. I’ll do it. No turning back. I reached for the glass. Still warm. I took a whiff. Rank. The dark green, yellowish brown mixture contained leaves with bits of mushroom floating in it. Here goes nothing. I drank half of it before gagging, then forced myself to swallow the rest. Soon, Joe, Mark, Marie and I sat in a small circle on the straw-strewn dirt floor of our hut and waited. A slender beam of light cast from the oil lantern projected long shadows in the gloomy thatched-roof hut. The lantern was replaced with flickering candlelight. My skin prickled. My heart raced. Who knew what kind of vision would come. Antonio followed close behind and handed our spirit-leader a palm leaf he cut off from one of the trees. The brujo took the lid off some small brown bottles and placed them around the room. A heavy, woodsy smell filled the hut. We watched from our circle as the brujo waved the palm frond preparing to summon the spirits. When the brujo moved, I peeked. A turquoise scarf swung from around his neck. I also saw bright feathers and what looked like strange black and white markings on his torso, arms and legs. With both eyes closed, he chanted in a low voice, sweeping the palm frond back and forth. He shuffled his bare feet rhythmically. He moved faster. Spoke louder. Shriller. My vision would surely come in a few minutes. At ninety-seven pounds, even a little of whatever I consumed affected me. Goosebumps covered my arms as I held my breath. What sort of images would surround me? I hoped for the best. 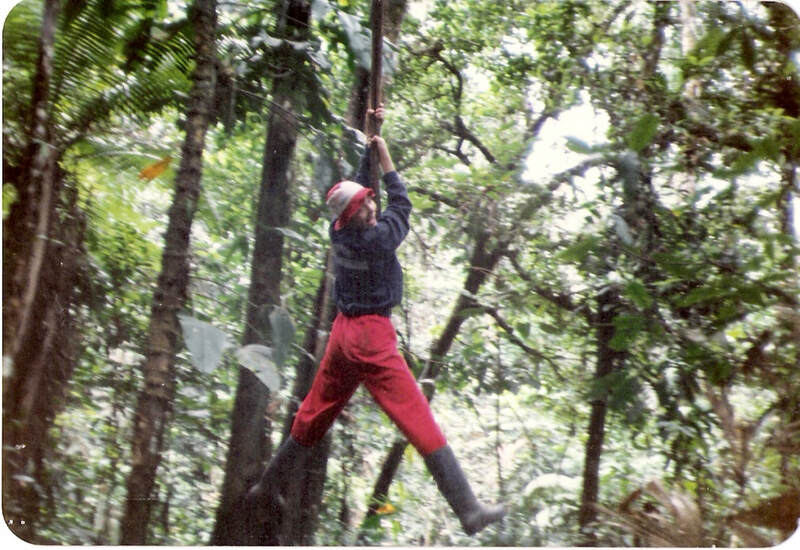 Unfortunately, this is not of this particular experience but it is of me in the Amazon swinging ... rather falling from ... a vine!